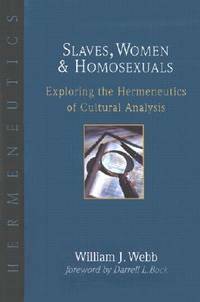 From Biblical Hermeneutics to Slaves, Women & Homosexuals, from	Biblical Interpretation to Culture and Biblical Hermeneutics, we can help you find the hermeneutics books you are looking for. As the world's largest independent marketplace for new, used and rare books, you always get the best in service and value when you buy from Biblio.com, and all of your purchases are backed by our return guarantee. Biblical hermeneutics is the study of the principles of interpretation concerning the books of the Bible. It is part of the more broad field of hermeneutics which involves not just the study of principles for the text, but includes all forms of communication: verbal, nonverbal and written. While Jewish and Christian Biblical hermeneutics have some overlap and dialogue, they have distinctly separate interpretative traditions, see also Judaism and Christianity. 1980-06-08. Good. Ships with Tracking Number! INTERNATIONAL WORLDWIDE Shipping available. May not contain Access Codes or Supplements. May be ex-library. Shipping & Handling by region. Buy with confidence, excellent customer service! 1997-07-03. Good. Ships with Tracking Number! INTERNATIONAL WORLDWIDE Shipping available. May not contain Access Codes or Supplements. May be ex-library. Shipping & Handling by region. Buy with confidence, excellent customer service! InterVarsity Press, 1992. Hardcover. Good. Disclaimer:A copy that has been read, but remains in clean condition. All pages are intact, and the cover is intact. The spine may show signs of wear. Pages can include limited notes and highlighting, and the copy can include previous owner inscriptions. At ThriftBooks, our motto is: Read More, Spend Less.Dust jacket quality is not guaranteed.